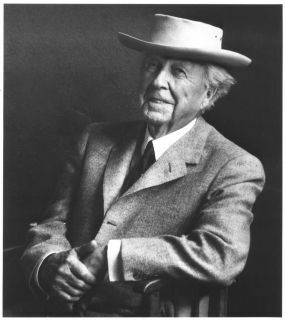 Governor Scott Walker has signed a bill into law that will designate a Frank Lloyd Wright Trail along several highway routes. The trail will begin in Kenosha County and continue through Racine, Milwaukee, Waukesha, Jefferson, Dane, Iowa, Sauk and Richland counties. $50,000 from the Department of Tourism will be used to place signage along the trail marking Wright attractions. in his ever-present pork pie hat. The architect was born in Richland Center, Wisconsin in 1867. The A.D. German Warehouse in Richland Center is the only FLW structure in his home town. Several other FLW design structures are extant in his home state, including the S.C. Johnson World Headquarters and research tower, Annunciation Greek Orthodox Church and American System Built Homes in Milwaukee County, along with several homes in various locations along the trail. Wright's studio complex, Taliesin, is located in Spring Green in Iowa County.